This is the second in a series, but I read it as a standalone and enjoyed it a lot. As a big sports romance fan, I was very happy to find a new author to read. It is not often that a side character really deserves first mention, but really Leo does! He was the unexpected voice of reason and champion of the closeted Van when things got tough. And his sartorial style and self-confidence was very endearing too. The story itself is well written, has a good pace, and deals with some big issues for both Van and Toby. There are some really lovely touches which bring to life these two men, and how much they feel about each other. A good read, thank you Ms. Carman. There were some really sweet moments in this story about Van, an American football star, and Toby, his yoga teacher. While much of the storyline is familiar to any readers of m/m sports romance (closeted star/secret relationship/threat of exposure), Toby’s personal experiences with an ex-boyfriend add a layer of suspense to the story. I like Van. He wears his star status lightly and reacts with kindness in difficult situations. For a main character and a romantic lead, he feels a little underdeveloped. I wanted to know more of his past and I wanted him to have hobbies and interests. This is really Toby’s story as most of the book is told from his perspective. I really didn’t warm to him. When he isn’t whipping himself into an emotional frenzy and playing hot and cold with Van, he’s allowing himself to be bullied by the ex-boyfriend he’s attempting to hide from. Meh. He’s a bit of a damp squib. The action sequences that focused on Toby and Austin, his ex, were a little bit bewildering at times. I hate it when an author allows characters to ignore the simple solution (call the police), in an obvious effort to draw out drama and tension. All the miscommunication in this story felt so contrived and repetitive that I wasn’t terribly invested in the final outcome of Van and Toby’s relationship. This is my first book by this author and I struggled with her writing style. I found the writing quite choppy and the dialogue didn’t always ring true. There was more ‘telling’ than ‘showing’ in this book and, as a result, the characters and situations didn’t quite feel real to me. Writing style is always a personal preference, so I’d urge readers to download a sample and make up their own minds. 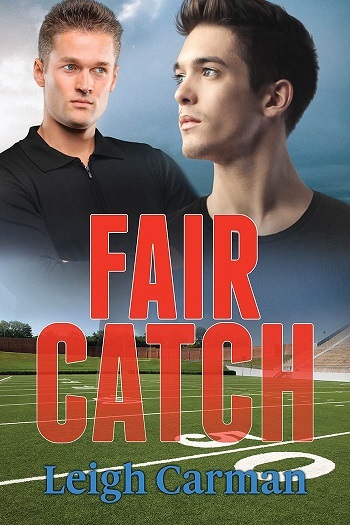 Reviewers on the Wicked Reads Review Team were provided a free copy of Fair Catch (Players of LA #2) by Leigh Carman to read and review.